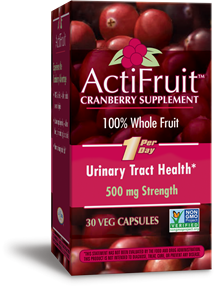 Why use ActiFruit™ Cranberry Supplement? Just 1 capsule per day - without the sugar of cranberry juice cocktails. Take 1 capsule daily. If pregnant, nursing or taking any medications, consult a healthcare professional before use. plant-derived capsule (hypromellose), magnesium stearate, cellulose, and silicon dioxide. Please describe the Patented BioShield® extended release system of ActiFruit Cranberry Supplement. How is the cranberry processed? The cranberry in ActiFruit Cranberry Supplement uses a patented BioShield® extended release system to deliver nurturing bioactives throughout the day. The cranberry is pressed to remove the juice, which is then concentrated. The remaining part, called the pommace, is dried and then blended with other fibers. The concentrated juice is added back into the fiber mixture, which now has all the parts of the whole cranberry - skin, juice, seeds, and fiber. The fiber matrix shields the key components from stomach acid, and the natural pectin content slows its breakdown in the intestines and allows for a sustained release of the bioactive compounds. * This process is described in US patent 6,440,467.